Cala Gogo is a 5 star campsite located in Saint-Cyprien in the Roussillon region of France. Cala Gogo is a wonderful, modern, family orientated campsite which benefits from a wonderful location between Argeles-sur-Mer and Saint-Cyprien on the south coast of France. This fantastic 5 star quality campsite has a a typically French atmosphere and not only benefits from some truly wonderful scenery but it’s also well landscaped to provide a really relaxing and luxurious feel. The campsite is also highly popular with those families looking for a great range of activities and facilities both on-site and also nearby. Those looking to explore the area from Cala Gogo won’t be disappointed with the range of things to do and places to see. The Pyrenees can be seen in the distance and there are plenty of cycle tracks and places to walk within easy reach. You’ll also find a great range of water sports, boat trips and a large array of bars, cafes and restaurants in Saint-Cyprien and Argeles-sur-Mer and the wonderful city of Perpignan is also only a stones throw away. One of the great things about Cala Gogo is that it benefits from having direct access to a lovely family friendly beach. Covered in soft golden sand and with the warm Mediterranean sea lapping against the shore, the beach is the perfect place to sunbathe, build sandcastles, swim, play games and most importantly of all, have fun! For those who’d rather stay on-site and take advantage of the swimming pool facilities you won’t be disappointed. There are in total three swimming pools including a lovely lagoon styled pool with rocks, tress and sculptures, children’s slide and of course some fantastic sun terracing where you can sit back and relax. 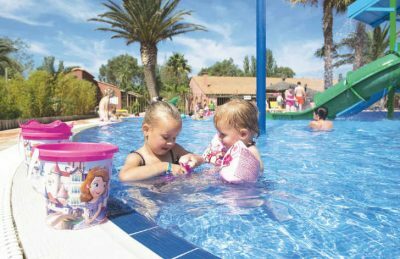 Cala Gogo campsite offers a comprehensive selection of activities and facilities on site and also nearby to ensure you have a fantastic family holiday. On-site activities at Cala Gogo campsite include table tennis, tennis, basketball, volleyball, boules, scuba diving, playground and cycle hire. Facilities available at Cala Gogo campsite include WIFI, restaurant, takeaway, bar, groceries, games room, animation team, washers and dryers. Accommodation at Cala Gogo campsite includes a range of 2 and 3 bedroom mobile homes that are available from Eurocamp.